Kermit Gosnell’s atrocities aren’t an argument for stricter abortion laws. Stricter abortion laws won’t do it. 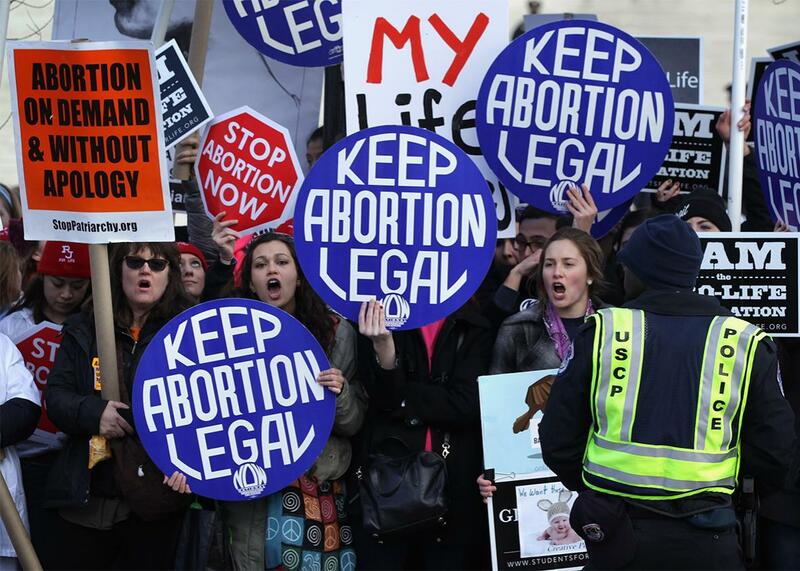 Pro-choice activists shout slogans before the annual March for Life passes by the U.S. Supreme Court on Jan. 22, 2015, in Washington, D.C. In March, the Supreme Court will hear Whole Woman’s Health v. Cole, a challenge to Texas’s HB 2 law that places stringent requirements on abortion providers. There is one argument that will surely come up to justify HB 2: the need to prevent another Kermit Gosnell. Gosnell is the infamous Philadelphia criminal who made national headlines for preying on vulnerable women seeking abortions. He was arrested in 2010 and ultimately convicted in 2013 of a slew of charges, including three counts of first-degree murder and one count of involuntary manslaughter. Gosnell committed countless atrocities against women and newborns at the Women’s Medical Society in West Philadelphia, the filthy and hazardous facility he owned and operated that bore no resemblance to a professional medical office. The argument connecting Gosnell to the Texas abortion law before the Supreme Court is simple: As proponents of the law have repeatedly argued in legislatures, court decisions, and online, greater restrictions on abortion facilities would prevent future Gosnells. The Texas requirements, for example, demand that doctors have admitting privileges at local hospitals and that clinics meet the exacting standards of ambulatory surgical centers. There are three important reasons that Kermit Gosnell is not a justification for the law that, if fully enforced, will leave Texas with only nine or 10 abortion clinics—down from more than 40. First, the story of Kermit Gosnell is not one of under-regulation, but rather of government failing to enforce already-existing laws that were more than sufficient to shut him down. When Gosnell was operating his criminal enterprise, Pennsylvania’s restrictions on abortion—which included physician-only provisions, a mandatory 24-hour delay, biased counseling, parental consent, gestational limits, broad public funding bans, exhaustive reporting requirements, burdensome facilities regulations, and detailed clinical care requirements—were among the nation’s toughest, and served as a template for other antiabortion legislatures across the country. And like all other states, Pennsylvania had criminal laws on the books that prohibited murder, manslaughter, conspiracy, fraud, and other crimes of which Gosnell was convicted. Gosnell operated his illegal facility for years because the state of Pennsylvania failed to inspect his clinic and ignored repeated pleas from responsible abortion providers to shut him down. Pennsylvania’s antiabortion governor at the time, Tom Corbett, admitted as much: “Laws are already on the books that should have prevented this situation.” Gov. Corbett leveled blame not at the Legislature for failing to enact sufficiently strict regulations of abortion clinics, but at public officials who did not enforce the already-existing laws. “It happened because people weren’t doing their jobs, plain and simple,” he said. Second, medically unnecessary abortion regulations—like the Texas regulations at issue before the Supreme Court—actually help to create the conditions in which marginal or illegal abortion practitioners like Kermit Gosnell can operate. When legislatures single out abortion providers with medically unnecessary rules, the cost and burden of complying with the law forces many safe, responsible providers to shut their doors, effectively opening the door for rogue practitioners to thrive. Two studies by California State University economist Marshall Medoff have examined this issue. Medoff finds that over-regulation of abortion does not affect demand for abortion, as women will continue to seek abortions regardless of the regulations in effect. But over-regulation of abortion does affect the number of facilities that provide abortions, by reducing the number of competent providers. A recent study about self-induced abortion in Texas concluded that “legal restrictions on abortion tend to increase unsafe abortion, but do not reduce the overall incidence of abortion.” International researchers have also shown that more restrictive abortion laws lead to greater incidence of unsafe abortion. Thus rather than making Texas a safer place for abortion patients, the law at issue before the Supreme Court is more likely to create an environment in which Texas women risk finding their way to another Gosnell. Third and finally, the restrictions at issue in Texas are also likely to reduce the chance that a responsible, skilled abortion provider will have the opportunity to report the next Kermit Gosnell to authorities. Pennsylvania’s experience shows that responsible, lawful abortion providers are well-positioned to be whistleblowers—to provide the first line of defense against illegal practitioners. Providers for whom patient health and safety are paramount have a strong incentive to root out substandard facilities in order to protect women who need their care as well as their own reputations. Because they are able to win patients’ trust, legitimate abortion providers are an important source of intelligence about substandard or marginal practitioners. If only public officials had treated providers as trusted partners and heeded warnings about Gosnell, the providers could have served as vital liaisons and hastened the end of Gosnell’s criminal enterprise. Ultimately, abortion regulations that add nothing to health or safety and that merely burden reputable providers will not prevent the next Kermit Gosnell. Rather, by driving quality abortion providers out of business, those regulations both deprive women of access to safe abortions and provide the conditions in which criminal opportunists like Gosnell can prosper.